SHOULD YOU BE CONCERNED WITH HAVING A LARGE TREE ON YOUR PROPERTY? 317 Tree Service are experts in tree removal. Employing one of the few ISA Certified Arborists in Central Indiana, Tyler Lott has removed thousands of trees ranging from harmless to extremely hazardous. About 80% of the work we do is hazardous removals of some sort, whether it be because of disease, storm damage, foundation damage or the need for sunlight enhancement. Safety, efficiency, skill, and proper insurance is important when it comes to tree removal. 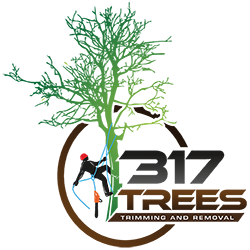 317 Tree Service is capable of removing your trees whether they are hanging over your house, nuzzled in your rhododendrons or deep in the backyard overtop your pool. We also provide complete and full cleanup! We take great care in listening to your needs and provide professional advice and customized services regarding the best course of action for your trees. Rest assured that your work will be overseen and executed by a Certified Arborist. 317 Trees employs true tree care professionals that are licensed through the International Society of Arboriculture (ISA). At 317 Trees, we have one of the largest cranes in the industry. Utilizing a crane is by far the best way to remove unwanted and hazardous trees. We are often able to remove trees in your backyard without ever leaving your driveway. Using a crane is Safer, faster, and more economical than traditional methods of tree removal. Best of all, It drastically reduces damage to your yard! Heavy portions of trees can be lifted and lowered gently with pinpoint accuracy, instead of being dropped onto your landscape. Being able to reach trees so far away often alleviates the need to bring heavy trucks over your lawn and into your backyard. With our crane we are able to surgically remove trees that are competition can only dream about.